This pizza is AMAZING! 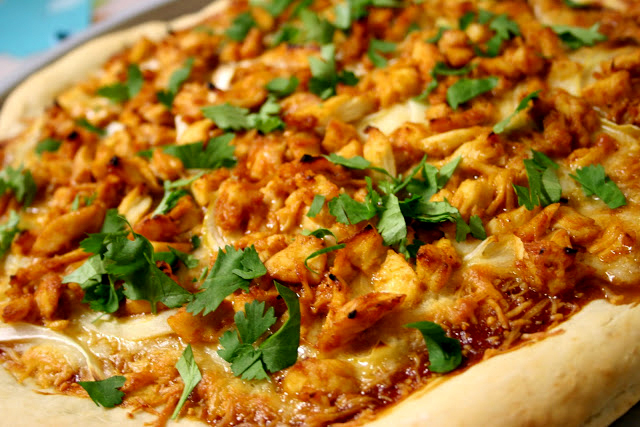 If you love BBQ chicken pizza, then this is the recipe for you! I just used the pizza dough recipe from a previous post, and it turned out great. I also just used an Italian blend cheese mix because I have no idea where to find gouda. Make sure you put cilantro on the pizza, too. It makes it so much better! 1. Preheat oven to 475 degrees F. Heat oil in a large skillet over medium-high heat. Add chicken tenders and saute until golden brown, about 12-15 minutes. 2. Remove from heat. When chicken is cool enough to handle, dice chicken to yield a little over 1 cup. In a small bowl, toss chicken with 2 tablespoons barbecue sauce. Set aside. 3. On a floured surface, roll out dough and place on a greased sheet pan. Shape to fill the sheet pan, about a 15 by 10-inch rectangle. Spread remaining barbecue sauce evenly over pizza dough. Sprinkle gouda, mozzarella, Parmesan, onions, and chicken over top. 4. Bake for 20 minutes or until cheese bubbles. Sprinkle with chopped cilantro and cut into pieces. Looks like it's straight out of Fire House. Maybe I'll attempt pizza dough again and try this recipe.